The fabulous Frankie of FashionDough.com reached out a while back and asked if any bloggers out there would be interested in joining a bloggers book club. Books you say? Blogging you say? You can count me in I say! Melanie is a special girl. I went into this book expecting one thing and found something completely unexpected within its pages. For one thing…there was zombies! The girl with all the gifts is set in a post apocalyptic society, set years after the outbreak. We meet a young girl, Melanie, who is confined to a prison cell on an army base. Daily, she is strapped to a chair at gun point then wheeled into a classroom. Something just isn’t right with this picture. Something isn’t right with Melanie. Melanie’s life on the base is very structured, regimented and unusual, considering she is just a sweet 10 year old girl, the adults reactions around her are certainly unsettling. I mean, what 10 year old could still say 'please' and 'thank you' with a gun pointed to her head? As Melanie goes through the motions of her mundane existence, she starts to realize something is not quite right…and where do her classmates keep disappearing to? I actually wasn’t expecting this book to be as compelling as it turned out to be! See, I really like films, shows and books that are about zombies and I’m always intrigued by the different takes people have on the flesh eating nasties. The girl with all the gifts certainly puts its own spin on it that’s for sure…especially when we learn these are not your traditional zombies. After the base is overcome and our host of main characters are thrust into the outside world, we finally start to see just what’s been going on and what is left of civilization. It doesn’t paint a pretty picture that’s for sure. But it does paint an honest picture. From start to finish, what really captured me about this tale was its take on humanities fight for survival, its need to win the war and live on even when the odds are stacked against them. Imagine being one of just a handful of what’s left of the human race, to see your species extinction on the horizon and realize you’re going to lose this war. The novel is a page turner and an easy read. The science side of things (yes, we get some science!) is interesting and understandable. The tension is palpable during some scenes and I found myself gasping out loud once or twice when certain mysteries were revealed. Zombies, yes, but scary? Not so much. It's the living that scared me more. I actually liked the brief take on evolution and am keen to see (if it ever happens that is!) how this new world Carey has created evolves. If there was ever a sequel I'd be first in the line for my copy! 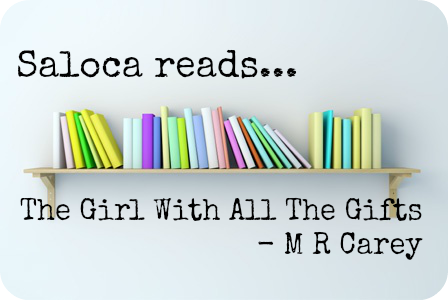 Have you read The girl with all the gifts? Let me know in the comments below! I haven't ever read this book before, but I think it's awesome that you've joined this blogger book club and managed to enjoy it. This definitely does sound like an unusual book and I haven't heard of anything quite like it. I will keep an eye out for it! If you get a chance be sure to give it a read, I was really surprised by how much I ended up enjoying it!